MoULe at the "Festival della Scienza"
The MoULe Core (MoULe-C) accesses the Moodle database to store MoULe localization and learning activities data and provide Web Service interfaces to the standard wiki, forum and chat Moodle activities. Moreover, MoULe-C includes a Web Service interface to a specialized search engine that provides information search capabilities based on: localized data (with space coordinates) on the Internet; localized data on a specialized search engine; localized data on the repository; open search on the Internet. 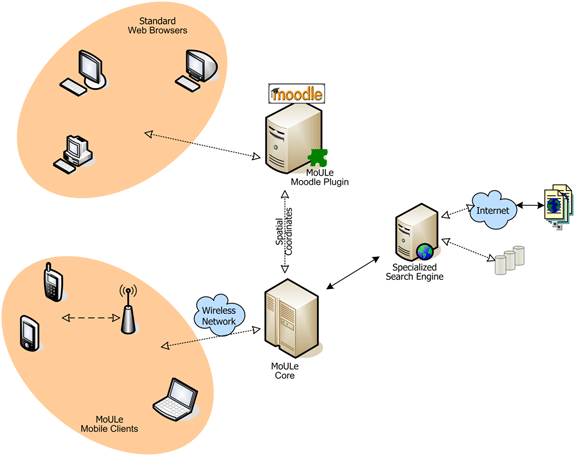 The MoULe Moodle Plugin (MoULe-MP) allows teachers to setup a MoULe learning environment that corresponds to the activation of specific functionalities (like wiki, chat, forum, searching feature) which are available through mobile and/or desktop devices. So the system will permit teachers-users to choose between collections of predefined learning environments; personalize these environments; create new environments. In a typical scenario, the teacher will be able to select some learning goals, then the system will suggest a “possible” environment for achieving them and will permit the modification of the pre-built environment available to the users. Finally, the Moodle plug-in allows teachers to monitor student activities. The MoULe Mobile Client (MoULe-MC) is a PDA application that allows users to participate in the MoULe learning activities by accessing the MoULeC web services. MoULe-MC makes the use of collaborative tools (such as wiki, chat and forums) through mobile devices efficient and effective. Moreover, using mobile device with GPS localization systems MoULe-MC can locate the site that the student is visiting and support his/her activity providing contextualized information that the students obtain from the specialized search engine. Location information can also make Moodle wiki, chat and forum more appropriate for on-site contextualized activities.